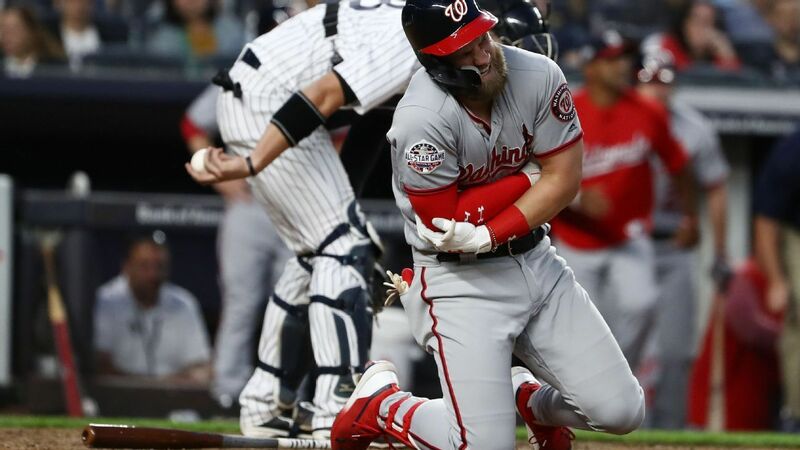 Washington Nationals star Bryce Harper had to leave Tuesday night’s game against the New York Yankees after being hit on the left foot by a pitch in the eighth inning. Harper was hit by Dellin Betances with an 89 mph slider with nobody out in the top of the inning. After taking a few steps toward first base, Bryce trotted back to the dugout, and did not return to the game. He was replaced by Brian Goodwin. Harper was also hit in the fifth inning on his right elbow by a 90 mph pitch from CC Sabathia and fell to the ground. Harper walked in his first two plate appearances Tuesday night. He is hitting .215 since May 1, dropping his average to .228. According to ESPN Stats & Information, Tuesday marked just the second time in Harper’s career that he was hit by a pitch multiple times in a game, the other coming in 2013.